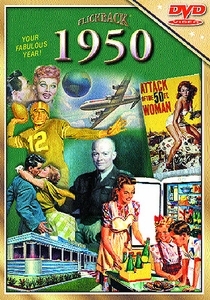 1950 DVD. 65th Wedding Anniversary Gift or 65th Birthday Gift. The comic strips �Beetle Bailey� and �Peanuts� made their debut in 1950 and so did your special someone! Or maybe they tied the knot! Either way, our 1950 DVD makes the grandest of 65th birthday gifts AND the most appreciated of 65th Wedding anniversary gifts! Maybe they remember gas was only 18 cents a gallon when planning their honeymoon! Or maybe they went on a date to see that classic, �Father of the Bride� with Spencer Tracy and Elizabeth Taylor. Could be they danced the night away to �Mona Lisa� by Nat King Cole or �Rag Mop� by the Ames brothers. For that matter, maybe your particular 65 year old was danced around to those tunes by their parents as they tried to get him or her to sleep! Which ever the case, this 1950 DVD will bring back memories and illustrate the way the world was during their special occasions! For a perfect 65th anniversary idea, which also works great as a 65th birthday idea, watch this 1950 DVD with a group of friends so your wonderful loved ones can reminisce about those great times in their lives. Sparks great conversation comparing politics then & now and leads to a whole new understanding of the times in which they lived! Help your cherished one create new memories while enjoying the old watching the captivating newsreel highlights from sports, politics, newsmakers, world events, and entertainment! For a great 65th anniversary gift! A great 65th birthday gift! Order this enchanting 1950 DVD today! Runs 30 minutes. See also our other 65th birthday and 65th anniversary gifts.